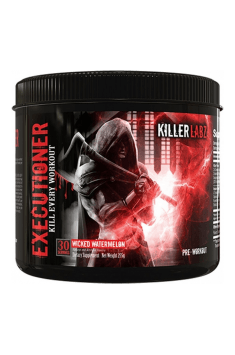 Executioner V3 is a new, refined form of an iconic pre-workout by KILLER LABZ. It universally supports effort abilities, enabling even the most experienced sportsmen, resistant to the effects of popular pre-workouts to reach the heights of training possibilities. Dicreatine malate – an advanced, highly assimilable form of creatine, the most popular supplement increasing physical abilities. Creatine constitutes energy substrate in the phosphagen process of energy extraction by cells, which is the main energy pathway for skeletal muscles and a way to increase muscle strength. It allows to apply higher training load, generating stronger stimuli to build muscle tissue. As for anabolism, creatine also works by the ability to modulate the concentration of myostatins. These are regulating proteins, deciding about inhibiting muscle tissue growth. Their reduction is conducive to the creation of anabolic environment. Beta-Alanine – an amino acid being the component of carnosine, endogenous synthesis of which is dependent on the systemic concentration of beta-alanine. Carnosine, from the point of view of effort abilities plays a key role as a buffer of acid-base environment in muscle tissue. In intensively working muscles it neutralizes the effect of lactic acid, which is responsible for muscle pain, limiting training abilities. Therefore, reducing the activity of lactic acid allows to take advantage of longer, more intensive training sessions. Taurine – positively influences energy functions of muscle tissue by increasing creatine transport. It prevents decreasing muscle efficiency related to limited endogenous synthesis of taurine, which takes place as a result of intensive physical effort. Its supplementation allows to maintain maximal effectiveness of muscle work for a long time. Moreover, taurine stimulates metabolism of nerve cells, increasing the efficiency of the work of neurons. It increases cognitive abilities, facilitates concentration and memorizing. High concentration of taurine in the nervous tissue is characteristic for the organism in the phase of intensive development. L-Citrulline – an amino acid responsible for the so-called “muscle pump”. It increases endogenous synthesis of nitric oxide, which widens the lumen of blood vessels. In this way, it increases efficiency of the cardiovascular system, causing increased transport of blood. It is related to the improvement of the nourishment of peripheral tissues. During training, working skeletal muscles mostly benefit from this. Increasing the supply of nutritious substances with blood enables maximalization of the efficiency of muscle work, positively influencing after-training regeneration. Creatinol-O-Phosphate – a structural creatine analogue, often confused with creatine phosphate, but totally different from this compound in the mechanism of activity and achieved effects. Similarly to carnosine (the precursor of which contained is the supplement is beta-alanine), it exhibits the activity as a pH buffer. It reduces the activity of lactic acid in muscles, limiting their soreness during training and increasing effort abilities. Selaginella Tamariscina extract – the source of amentoflavones, bioflavonoids exhibiting the ability to inhibit phosphodiesterase PDE, which is responsible for the breakdown of cGMP and cAMP. Increasing the level of cGMP is related to widening blood vessels, which in turn allows to better nourish muscle tissue. By working in this respect synergistically with citrulline and theobromine contained in the supplement, amentoflavones allow to achieve strong muscle pump. Limiting the breakdown of cAMP is related to acceleration of metabolism on cellular level, thanks to which it increases the efficiency of cell work. Moreover, high concentration of cAMP is conducive to lipolysis and increases the rhythm of heart work. L-Tyrosine – an amino acid increasing effort abilities, stimulating cognitive abilities and positively influencing mental functions, thanks to the presence of the synthesis pathway of many hormones and neurotransmitters. It is, among others, a precursor of dopamine, which conditions muscle coordination and proper muscle stimulation. It also has influence on psychological functions, including the sense of motivation. Tyrosine also increases the synthesis of adrenaline and noradrenaline, which introduce the organism in the state of readiness to undertake physical effort. They cause the increase of blood transport to skeletal muscles, acceleration of heart action and stimulation of energy systems. As for metabolism, tyrosine is also active as a precursor of thyroid hormones, thyroxine and triiodothyronine, which accelerate metabolism. Cocoa bean extract – in supplementation, it is appreciated for the content of anandamide, phenylethylamine and theobromine. The first two work like stimulants, causing stimulation of the organism and mood improvement. They are related to the occurrence of the so-called “runner’s high”, i.e. the state characterized by good mood, increased endurance and limited susceptibility to pain. Theobromine, on the other hand, causes the increase of the lumen of blood vessels, increasing the nourishment of muscle tissue. It also accelerates hearth rhythm. Caffeine anhydrous – is a popular stimulant, conditioning stimulating properties of coffee and yerba mate. It affects the organism in two ways. Firstly, it binds with adenosine receptors, without causing their stimulation. In this way, it limits the activity of adenosine, the role of which in the organism is signaling fatigue. Secondly, it is a competitive inhibitor of cAMP-phosphodiesterase, increasing at the same time the level of the active form of cyclic adenosine monophosphate in cells. cAMP is responsible for the stimulation of cell metabolism and energy functions. Eria Jarensis extract – the source of N-phenylethylamine, a substance compared to DMAA, but with a gentler effect. It has strong psychoactive effect, works euphorically, increases the level of motivation and energy. It limits the feeling of pain and fatigue, allowing to perform more intensive training sessions. It also has the ability to intensify fatty tissue reduction, increasing thermogenesis. Mandarin orange extract – the source of beta-cryptoxanthin, a carotenoid which is a strong antioxidant. It reduces oxidative stress, the creation of which is intensified during physical effort, limiting cell apoptosis. Decreasing the level of free radicals is one of the most effective forms of cancer prophylaxis. Cryptoxanthins may also demonstrate anabolic activity, especially in relation to bone tissue. Bitter orange extract – contains a strong thermogenic, synephrine, which is commonly used as a substitute for ephedrine. It stimulates lipolysis, supporting fat metabolism. It also has stimulating effect, thanks to the ability to activate adrenaline receptors. It also influences cognitive abilities, facilitates concentration and increases mental ability. It exhibits synergistic effect with caffeine, also present in the preparation. Summing up, KILLER LABZ Executioner V3 is a complex pre-workout supplement, guaranteeing maximal stimulation and increase of organism’s efficiency. Thanks to the application of the substances appreciated for their effectiveness and power, it constitutes an appropriate choice for the most advanced group of recipients, who are looking for strong solutions, supporting the toughest training sessions. One serving (one serving = one scoop) 30 minutes before training. You should not consume more than 2 scoops in one day. You can skip taking this product in non-training days. Due to the exceptionally strong composition of the supplement, I do not recommend increasing the dose above the dose suggested by the producer. The supplement should not be used by people with hypertension or with any other problems with the cardiovascular system. The product may be used as support during exceptionally tough days, with long physical and mental effort. I suggest dividing the dose of the product into several smaller portions and take at regular time intervals for the whole duration of effort. The supplement cannot be used in the evening hours due to its high content of stimulants. Killer Labz is a manufacturer of highly efficient termogenic fat burner called "Exterminator", which literally kills the fat. It gots its effectiveness from ingredients carefully selected during tests, what also makes its composition safety. This approach to the production of supplements causes that the market eagerly looks for the next unique preparations by KillerLabz.